Boeing employee Jamie Rosen realizes that the capabilities and analytical tools she used in Finance are similar to the ones she currently uses in Marketing. New college hire Rich Bradford takes advantage of an opportunity to learn about Boeing and prepare for roles with more responsibility in a shorter period of time. And Marie Valenta, who felt her strength was in being a "big-picture visionary," tackles the detail-heavy task of managing a companywide project that conducted 88 training sessions at 17 sites. What's the common thread between these Boeing people? They took advantage of job rotation programs to learn in a relatively short amount of time a variety of disciplines within a function—and to ultimately enhance their skills and experience. Boeing fully supports activities designed to develop employees' skills and broaden their experiences for personal and professional growth. One way the company does that is through rotational programs. Employees who participate in job rotations say they find the rotations are a great way to enhance their experience. As a result, they said, these stints help them become a stronger member of the Boeing team. "Boeing values the diversity and growth that comes from employees having a variety of experiences. Rotational programs help employees learn about the company and its businesses," said Rick Stephens, senior vice president, Human Resources and Administration. Generally speaking, a job rotation program is a set of sequential, temporary assignments of predefined duration within a given field, such as Engineering, Finance or Marketing. But don't think that job rotations resemble a game of "musical chairs": Rotation programs also must have a clearly defined idea of what will happen to the employee at the end of the rotation. There's no "odd person out." Participation in a program and job assignments within the program are limited to a predetermined maximum duration. The program generally has a formal and advertised process for self-nomination. There must be a process for periodic review of the program's utilization of women and minorities and selection decisions. There must be a documented process for the placement of individuals at the conclusion of the program. "While all development programs must be open for self-nomination, they may only be open to only those within a specific specialty," said Stephens. "In general, employees who self-nominate for rotations should have had a Performance Development Partnership-style conversation with their manager prior to nomination, too." Programs are not the only way employees can obtain experience and exposure to different disciplines, however. Employees also may take the initiative to create their own form of job rotation simply by using the Boeing Enterprise Staffing System (BESS)—applying for and being hired into new and different positions. Employees also may work with their managers to identify special assignments or unique project opportunities within other organizations. Here are three Boeing employees whose careers are taking a turn for the better through job rotation programs. Jamie Rosen—building her "tool kit"
Jamie Rosen is a four-year Boeing employee who is broadening her experience in Commercial Airplanes Marketing through a job rotation in Renton, Wash. After talking about it with her management in her annual Performance Development Partnership discussion, she applied for the rotation though a requisition posted on BESS. "I'm in the learning phase of my career," Rosen said. "I am really drawn to rotation programs, because I enjoy not only learning how individual functions operate but also how they might work together more efficiently and cooperatively." Case in point: Having worked in Finance before coming to Marketing, Rosen said she noticed both groups use similar capabilities and analytical tools. The Marketing job rotation program is two to four years in length, depending on the skill level of the participant, and is made up of one-year rotations. The program acts as a developmental program to prepare employees seeking roles in Sales and Marketing. "The program is very flexible for the individual, based on their skills and aspirations," Rosen said, noting that the rotation program is geared toward creating generalists, or people with strengths in core marketing skills. Rosen said many participants have a longer-term goal of moving into Sales or Airline Analysis. 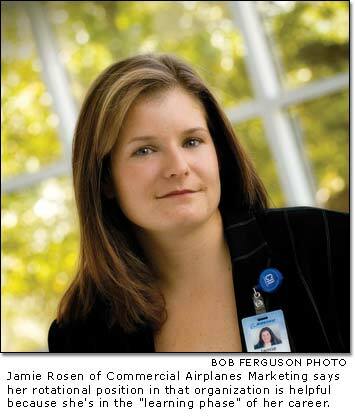 Rosen's second rotation, which began in April, is in Airline Financial and Investment Analysis. There she is learning how to support sales campaigns from a financial perspective, working with cash flow analyses, modeling financial statements, and performing product value analysis—all to help customers make informed business decisions based on the merits of various product offerings. "We help our customers see the value a 737 can bring to their bottom line, for example, relative to an A320, given the airplane's capability, capacity, reliability and long-term value," Rosen said. "Some argue that it's better to become an expert within a group. But for me, it's really about learning where your passions lie early and then figuring out how you can align that passion with a career that brings value to the company and those around you," Rosen said. "I'm still building my tool kit. Job rotations help you create a self-awareness of what you enjoy and what you want to do with your life." Job rotation programs also are a great way to get younger employees up to speed rapidly and prepare them to take on leadership roles, or roles with more responsibility, in a shorter period of time. Rich Bradford, an Operations Accounting employee in Huntington Beach, Calif., is one such candidate. Bradford is a participant in the Business Skills Rotation Program, a job rotation program specifically for new college hires in Boeing Integrated Defense Systems Finance. 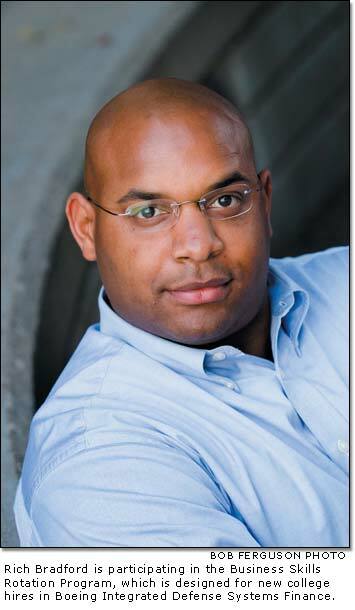 Bradford has a bachelor's degree with an emphasis in finance from San Diego State University. He was one of the first people selected for this program. "In the beginning it was hard for me to gauge what level of readiness I was at," Bradford said, acknowledging that there is a steep learning curve coming into Boeing. After the first few months, however, Bradford felt he could take charge of his career and get more involved. "I've had a lot of responsibility in this program from the beginning, and it has been good to know [site management] has faith in me," he said. When Bradford came to Boeing, he worked for a couple of months in a general capacity and then began rotating among different departments in IDS Finance. Each rotational assignment is for one year; participants move among programs in Contracts and Pricing, Operational Accounting, and Business Operations and Scheduling. "It's a learning process, and I have a much better understanding of the business now than I did—or would have had, had I not been in this program," he said. "I have long-term goals, but right now I'm focused on how to get the best foundation I can so I'll have choices down the line." After a thorough interview process, Valenta was chosen to lead the project and has been in this role for about 15 months. "Finance wanted to begin the training in October 2004, and I was hired in August," she said. "But there were no materials, trainers, site focals, implementation or communication plans—there was nothing to work with. I essentially had to create the infrastructure that would support everything we'd be doing." She ultimately was project manager of a team of trainers and site contacts resulting in 88 training sessions at 17 sites that reached more than 1,200 managers and nearly 300 executives. The assignment was a tremendous stretch. "Personally, I'm not good at details," she said. "I've always been a big-picture visionary. I had to get good at managing details very quickly." Now that the program is winding down, Valenta feels being responsible for such a complex, enterprisewide project gave her exposure to Boeing people and sites throughout the United States she otherwise would not have learned about. "I worked with people at every major site," she said. "I had the opportunity to learn about other sites, programs and business units through this rotational assignment. It was a great learning experience. I now have contacts all over The Boeing Company." The assignment also tested and enhanced her presentation skills. Valenta regularly had to create and deliver presentations to all levels of management. So what did Valenta ultimately learn from all this? "I learned that I really like project management and large, complex, challenging assignments," she said. "I learned that it is well-suited to my skills and who I am. I feel that I've done well and I want to do more." Valenta believes everyone has to take full responsibility for his or her own career. "The manager's role is to provide opportunities, to coach, to point out resources, help find a mentor, give feedback," she said. "But it's a supportive role. The rest is up to me. As an employee, I have to create a vision of where I want to go, create a plan, and implement it. Job rotations are one of the steps I can take to get there."